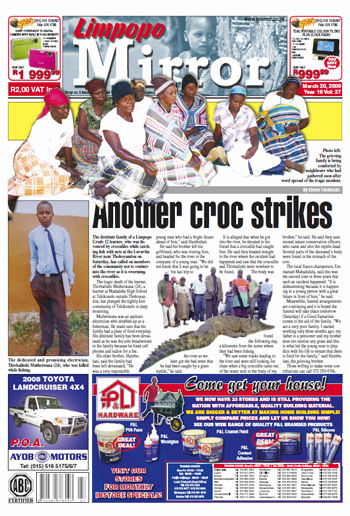 Officially, Venda Mirror later became the Limpopo Mirror, but for most of its readers, Mirror became a household name, a trusted friend and part of everyday life. During all these times, Mirror was part of the community, and we served the society through happy and sad days. Our reporters were standing next to our readers in long queues during the first democratic elections and all the other elections to follow. We were at gruesome crime scenes and in our courts. We were applauding our sports teams and we comforted struggling farmers through droughts and floods. Mirror rejoiced and cried with our readers. Mirror adopted the slogan A reflection of the community and we tried to strive for the truth. All the news was not always positive, but Mirror was there to reflect all the events. 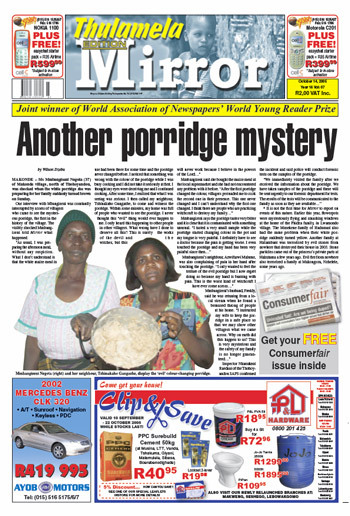 During the past 25 years, we used dedicated correspondents to supply us with the news and the paper became part of our faithful rea­ders and advertisers’ lives, and we hope to continue in years to come. Many of our readers were not even born when we published our first edition. It is impossible to mention all the news highlights, but some of the interesting news items during the first years of our existence are: In our first edition, we wrote about a hike in the petrol price – from R1,23 to R1,30 per litre! And we complained! The cover price of the Mirror was 20c (what a bargain!). 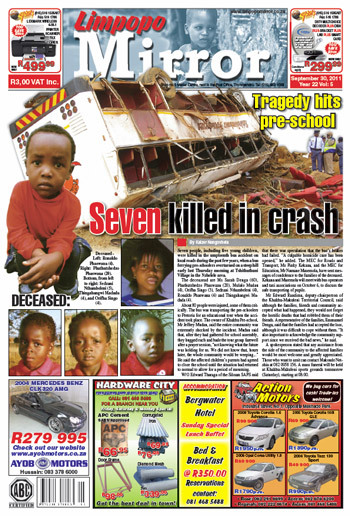 Twenty-four farm workers from the Mukumbane tea estate were killed in a truck accident on the Mutshindudu Bridge (October 19, 1990). An attack on school children by a group of white men in a park in Louis Trichardt made international headlines in November 1990. Two convicted murderers were executed in the Venda Central Prison (February 1991). March 1991 – An ecological disaster hit the area when the Luvhuvhu River was poisoned. Three men were sentenced to death for the necklace murder of Mrs Elemina Makulana. Senior officials of the Venda Agricultural Organisation, Agriven, were suspended, following a report by the Taylor Commission (May 1991). 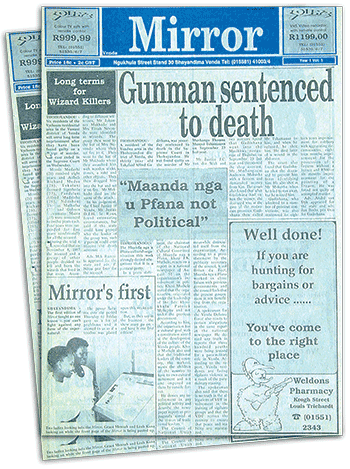 October 1991 – Outbreak of anthrax in the Makuya Park. July 1992 – Two young boys died of blood loss and infection after they had been circumcised at a traditional circumcision school. The rector of Univen, Prof Pieter du Plessis, was suspended by the Univen council in October 1992. 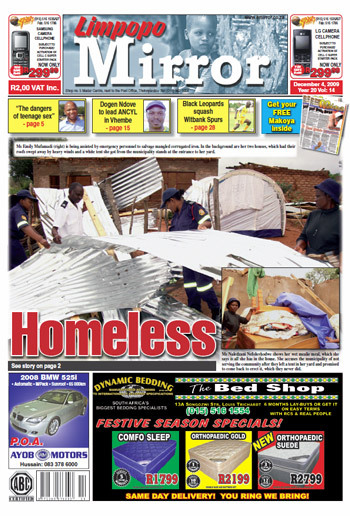 April 1993 – Looters hit out at all the Indian owned shops in the Thohoyandou business area after an unfounded rumour that a 13-year-old boy had been kidnapped by ritual murderers, hired by Indians. October 1993 – Shayandima Bobs Stars became the amateur soccer champions of South Africa, when they beat Basotho Tigers 2-0 at Hoffe Park in Kimberley. Gen Gabriel Ramushwana became the Officer Commanding of the National Peace Keeping Force in February 1994. Civil servants in Venda became involved in their first “pension strike”. In May 1994, a mutiny took place in the VDF and the officer commanding of Maunavhathu Battalion was taken hostage by angry soldiers. A shy 20-year-old Univen student, Basetsana Makgalamele, became Miss Northern Province, Miss South Africa and the first princess to Miss World. 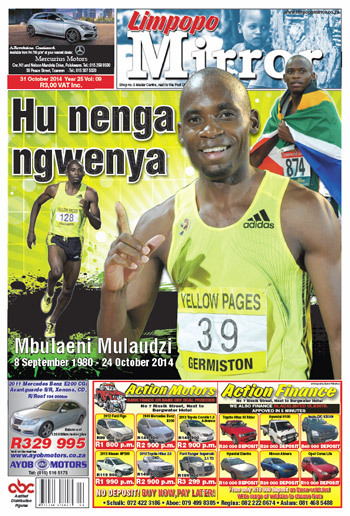 March 1995 – Local VDF athlete Martin Ndivheni became the South African Marathon Champion. 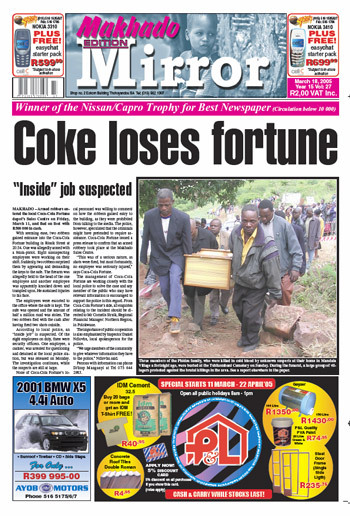 Local taxi boss Mr Johannes Makhokha was killed by an assassin in a dry cleaner’s in Louis Trichardt in July 1995. This was part of a prolonged taxi feud in the area, in which several people were killed. Philip Ndou won his first big medal when he lost in the final of the Africa Games. November 1996 – Former member of the Venda Boxing Association Cassius Baloyi became the featherweight champion of the WBU and Philip Ndou became the Commonwealth featherweight champion. It is impossible to publish all the news highlights of the past 25 years in one publication, but see if you can remember where were you when a specific incident took place.